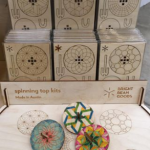 This kit allows you to fit wooden pieces together to make your own custom spin top! Use markers, highlighters, colored pencils- we don't recommend crayons, but pretty much anything else will do. Arrives flat, the kit measures 2 3/4" x 4 1/4", in a clear plastic sleeve with an instruction sheet. To ensure the steadiest spin, we suggest using a very small dab of glue to hold your top together. 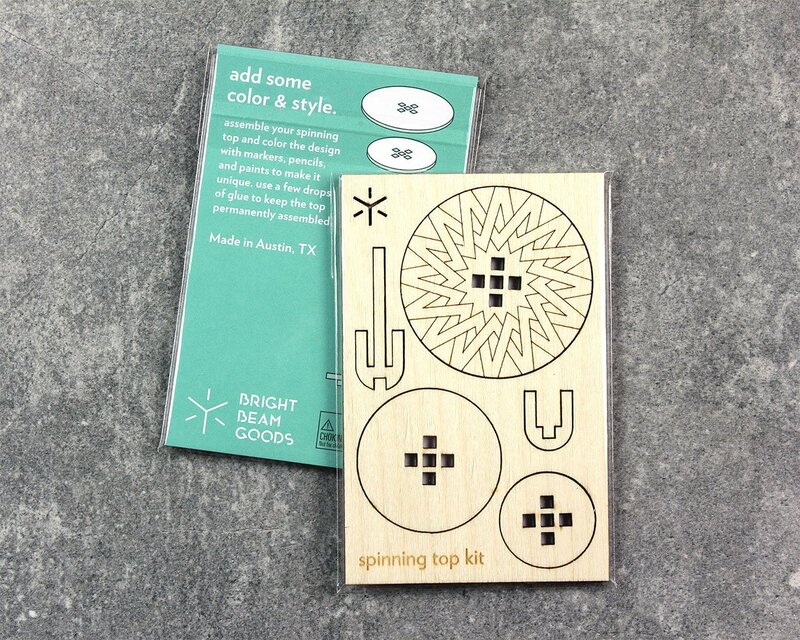 Small parts - not for children under 3.Each piece in this collection is laser cut and hand assembled in the Bright Beam workshop in Austin, Texas. Many of their products use natural materials; please expect your kit to have slight variation in cork texture, wood grain and tone of chipboard coloration.